Even though progressive rhinosinusitis with osteitis is a major clinical problem in granulomatosis with polyangiitis (GPA), there are no studies on how GPA-related osteitis develops over time, and no quantitative methods for longitudinal assessment. Here, we aimed to identify simple and robust CT-based methods for capture and quantification of time-dependent changes in GPA-related paranasal sinus osteitis and compare performance of the methods under study in a largely unselected GPA cohort. GPA patients (n = 121) with ≥3 paranasal CT scans obtained ≥12 months apart and control patients not having GPA or rhinosinusitis (n = 15) were analysed by: (i) Global osteitis scoring scale (GOSS), originally developed for chronic rhinosinusitis; (ii) Paranasal sinus volume by manual segmentation; (iii) Mean maxillary and sphenoid diameter normalised to landmark distances (i.e. diameter ratio measurement, DRM). Time-dependent changes in GPA-related osteitis were equally well measured by the simple DRM and the labour-intensive volume method while GOSS missed ongoing changes in cases with extensive osteitis. GOSS at last CT combined with DRM identified three distinct patient groups: (i) The no osteitis group, who had no osteitis and no change in DRM from baseline CT to last CT (45/121 GPA patients and 15/15 disease controls); (ii) Stable osteitis group, with presence of osteitis, but no change in DRM across time (31 GPA); (iii) Progressive osteitis, defined by declining DRM (45 GPA). 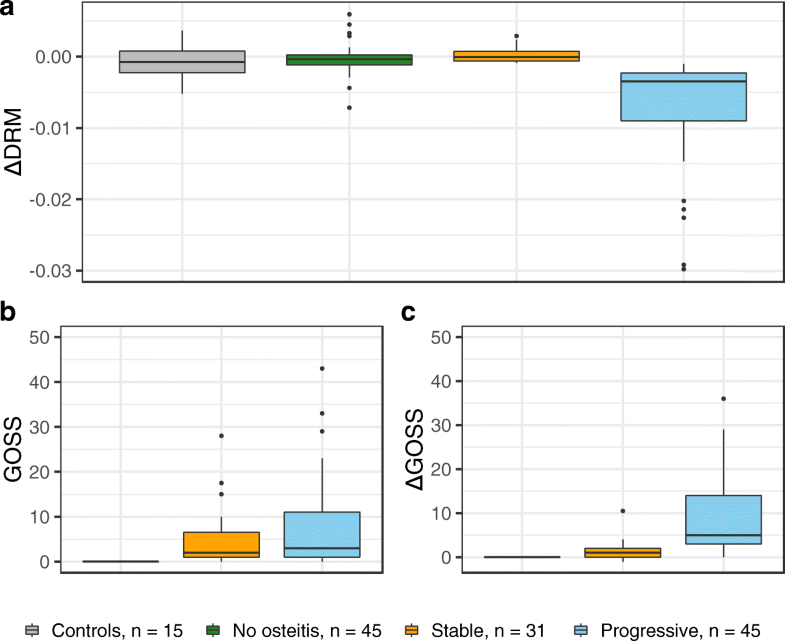 We suggest DRM and GOSS as complementary methods for capturing, classifying and quantifying time-dependent changes in GPA-related osteitis. Granulomatosis with polyangiitis (GPA) is a multi-organ relapsing remitting small vessel vasculitis that primarily involves the upper and lower airways and the kidneys. GPA has high disease burden and increased mortality, and runs an unpredictable disease course. Reported prevalence of GPA in Northern Europe ranges from 140 to 250 per million adults. Mean age at disease onset is approximately 50 years, with a small preponderance of men [1–5]. There are no diagnostic criteria for GPA. The GPA patients are most often classified by an algorithm developed for the European Medicines Agency (EMA) [6, 7]. This algorithm is based on the classification criteria for Wegener’s granulomatosis (former name for GPA) published in 1990  and the International Capel Hill Consensus Conference Nomenclature of Vasculitides from 1994 with an update in 2012 [9, 10]. The patient is classified as having GPA if having histological evidence of GPA or antineutrophil cytoplasmic antibodies (ANCA) specific for proteinase 3 (PR3-ANCA) or myeloperoxidase (MPO-ANCA), and surrogate markers that suggests granulomatous disease of the upper or lower respiratory tract, for example chronic rhinosinusitis (CRS) for more than 3 months . Upper airway disease appears to be common in GPA, with studies reporting frequencies up to 90%. Common manifestations are nasal and paranasal sinus symptoms (70%), hearing loss (36-51%) and subglottic stenosis (8-23%). GPA may involve the CNS (8%) and the orbits (15%) [11–13], which sometimes is caused by direct invasion from the sinuses. We have chosen to limit our study to the CT findings of the GPA-associated sinonasal disease and more specifically to the osteitis development. The characteristic CT features in GPA-associated sinonasal disease were recently reviewed by D’Anza et al. . Typical findings included mucosal thickening, extensive sinus wall thickening and destruction [15–20]. All the CT studies reviewed had a cross-sectional design. To the best of our knowledge, there are no published data on time-dependent sinus changes by CT in GPA. The sinus osteitis in GPA can resemble CRS of other aetiologies. In CRS there is a grading system for osteitis called the Global osteitis scoring scale (GOSS) , which has been applied in cross-sectional CRS studies. Maximum score for a sinus in GOSS is reached when the wall thickness is 5 mm or more. Since GOSS has never been tested in patient cohorts with GPA, it is not known how it would perform. It does, however, seem likely that the value of GOSS could be limited by a ceiling effect in GPA cases with very severe bone thickening due to osteitis. An alternative method for assessing osteitis could be sinus volume measurements. Since the sinus volume decreases in proportion to increasing wall thickness, this method should provide an accurate estimate of time-dependent osteitis changes. There are, however, technical challenges related to volume measurements. The quality of routine CT images does not always allow for semiautomatic volume measurement, and performing manual segmentations are too labour-intensive and time-consuming for every day clinical practice. Hence, alternative methods are needed that are reliable, but easier and faster to perform. For the current study we developed a method for capturing time-dependent osteitis changes. This method is based on changes in mean maxillary and sphenoid diameter measurements normalised to landmark distances (i.e. diameter ratio measurement, DRM). Since the DRM method requires that the size of healthy sinuses in adults does not change over time, the study includes analyses of serial CT data from a small control group not having GPA or rhinosinusitis. 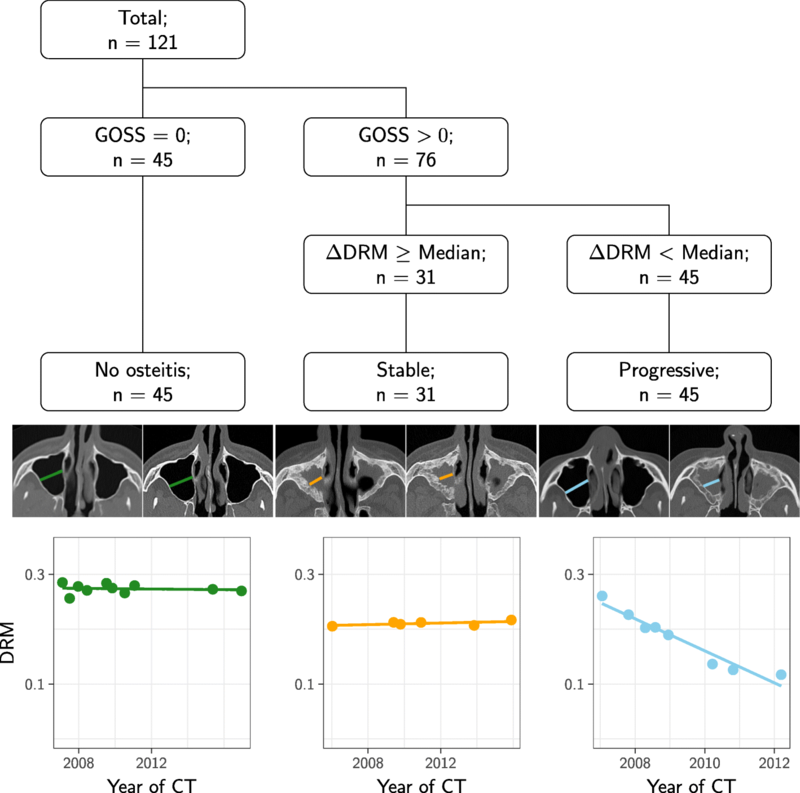 The primary aim was to identify simple and robust CT-based methods for capture and quantification of time-dependent changes in GPA-related sinus osteitis. We focused on three methods that had never previously been tested for this purpose: (i) the GOSS developed for CRS; (ii) determination of sinus size changes by measurements of sinus volume; (iii) determination of sinus size changes by the new method, DRM. The three methods were applied on a well-defined GPA registry cohort with serial CT scans available from 2002 onwards. The cohort covered the whole spectre of GPA, from cases with no signs of upper airway disease to cases with severe, progressive paranasal sinus complications. The study cohort consisted of 121 consecutive GPA patients from the Norwegian systemic connective tissue disease and vasculitis registry (NOSVAR), which is a consent-based research and quality registry run by the Department of Rheumatology at Oslo University Hospital (OUS). The patients were 18 years or older at inclusion in the registry. Inclusion criteria for the GPA patients in the study were: (i) they had a clinical ANCA-associated vasculitis diagnosis verified by a physician with vasculitis experience; (ii) the vasculitis was classifiable as GPA according to the updated EMA algorithm [6, 7]; (iii) the patient had at least three CT scans of sufficient quality available for analysis, and the time from the first to the last CT (i.e. the observation period) was at least twelve months. By review of electronic patient journals of the GPA patients, we recorded (i) ANCA status at the time of diagnosis; (ii) paranasal sinus symptoms reported by the patient at the time of the baseline CT; and (iii) history of sinus surgery before and during the observation period. The 15 control patients included had (i) no clinical history of sinusitis or vasculitis, (ii) no abnormal paranasal sinus findings, and (iii) at least three CT scans of sufficient quality during an observation period of at least twelve months. The indications for repeated CT scans in the control group were mainly arteriosclerotic disease in the neck arteries unrelated to systemic vasculitis. Median age of the control patients were 45 years, range 32-82 years, and there were 8 females. Osteitis was defined as new bone formation inside the paranasal sinuses. The development of osteitis was assessed by the GOSS , which has a scale from 0 to 5 for each sinus and involved scoring of 10 sinuses (score range 0-50). The scoring is based on sinus wall thickness (from <3 mm to >5 mm) and extent of wall involvement (less or more than 50%). We performed volume measurements of the maxillary and sphenoid sinuses using the open source software ITK-SNAP (www.itksnap.org) . When the slice thickness was ≤1 mm and there were no opacifications, a semiautomatic segmentation method was used (upper threshold level –400 HU). With thicker slices, the semiautomatic methods failed, and we had to do the segmentations manually by outlining each slice by hand. We measured five diameters of each maxillary sinus and four diameters of each sphenoid sinus, as well as two reference measurements (Fig. 1). Frontal and ethmoid sinuses were excluded due to frequent aplasia and/or extensive destruction. A dimensionless variable, termed diameter ratio measurement (DRM), was obtained by dividing the mean of the diameters of the four sinuses by the mean of the two axial reference measurements. Two independent readers, with more than 10 years’ experience, performed the measurements defined in Fig. 1, on 109 CT scans from 20 randomly selected patients of the GPA cohort. 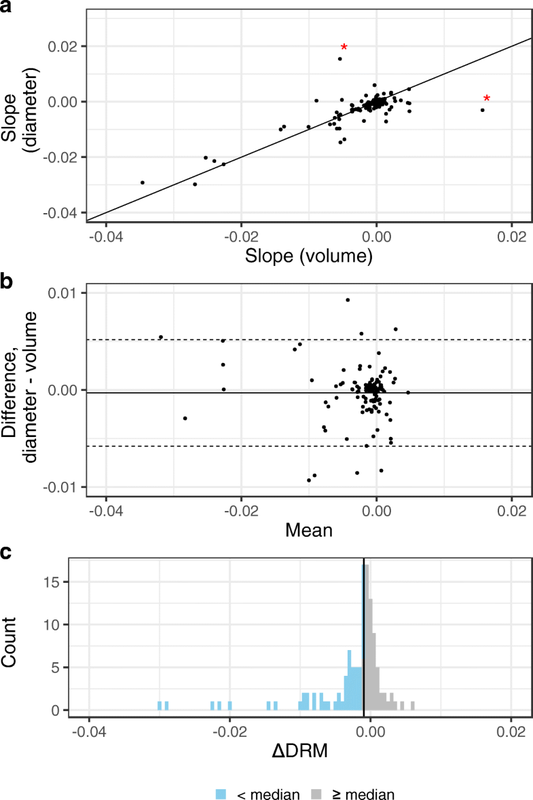 The intraclass correlation coefficients (ICC) for inter- and intrareader variability were calculated by a three-level mixed model with patients and readers as random effects. The reader who did the intraobserver study, performed the measurements of the rest of the patients. The discriminative ability of the method was tested by comparing the slopes of the control patients to the ΔDRM of the GPA cohort, assuming that patients with no paranasal sinus disease would have no change in serial sinus diameter measurements. To obtain a comparable size of the mean value of the volumes to the diameter-based method, we applied the cube root, calculated an average value and divided it by the reference measurements similarly to the DRM. See formulas for the diameter and volume-based measures in the Additional file 1: Appendix. The slopes from the volume measurements were calculated equally to the ΔDRM by linear regression and compared to the ΔDRM by a Bland-Altman plot . Extent of sinus opacifications was assessed by the Lund Mackay score (LM-score)  where each sinus was scored 0-2, and the ostiomeatal complex as 0 or 2 (obliterated), giving a score range of 0-24. Destruction of sinus walls, nasal septum, conchae, and hard palate were assessed by a sum score where 0 denotes no destruction and 1 that some parts of the structure or the whole structure was missing. Maximal destruction score was 18 (18 items). Missing structures due to surgery or inflammation were not separated. Sinus aplasia was registered. The statistical analyses were performed using the software R .
The baseline CT scans were performed at the time of the GPA diagnosis, or within the first year afterwards for 62% of the GPA cohort. The patients were above 18 years at the time of inclusion in the consent-based registry, but eight of the patients were younger than 18 years at the time of the first CT, see Additional file 2: Figure S1. All our patients fulfilled the EMA algorithm by diagnostic biopsy or ANCA combined with the surrogate criteria. The CTs were obtained between 2002-2016 on about 40 different scanners, and around 85% originated from Oslo University Hospital. More than 90% of the scans were in two planes (axial and coronal). Slice thickness ranged from ≤1 mm to 5 mm with 13% of the axial slices being ≤1 mm. Common CT findings at baseline were modest sinus opacifications, with LM-scores >0 in 81% of the GPA patients. Partly or completely missing lateral nasal wall was found in 21% of the GPA cohort, 12% had nasal septum perforation, and 11% had aplasia of the frontal sinus (Table 1). At the baseline CT, 23% of the GPA-patients had significant osteitis, defined by Georgalas  as GOSS ≥5. This proportion had increased to 40% at the last CT. Georgalas defined three grades of osteitis based on GOSS: mild osteitis (5-20), moderate osteitis (20-35) and severe osteitis, GOSS >35 (Table 2). The GOSS time development is shown in Additional file 3: Figure S2. 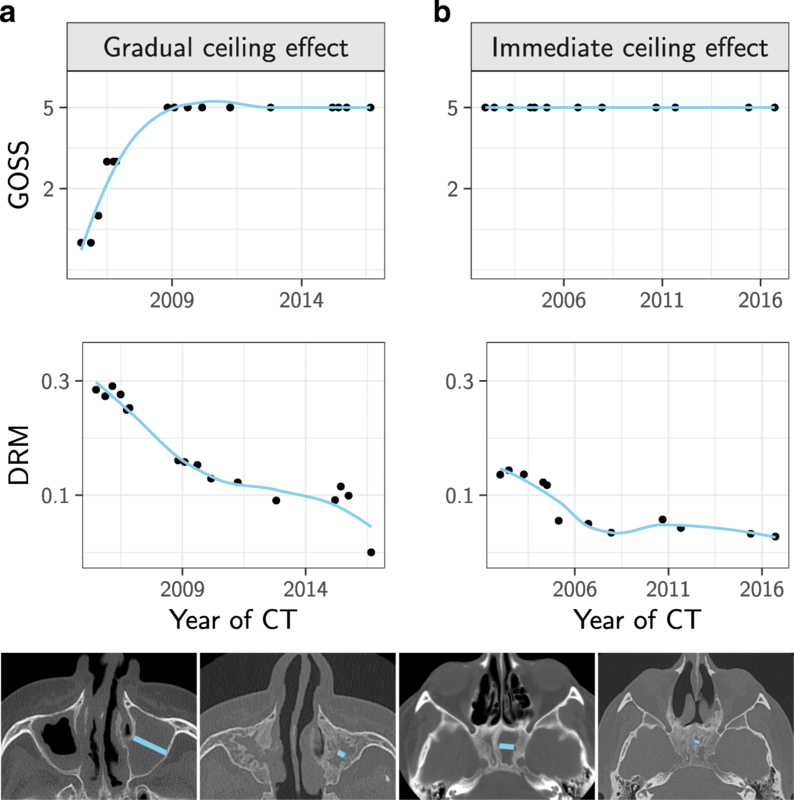 As detailed in the “Methods” section, we found that the ratio of the mean of maxillary and sphenoid sinus diameters (DRM) plotted against time between the serial CT scans, resulted in a curve with a linear pattern (Additional file 4: Figure S3). Since flat curves equalled unchanged sinus size across time and sloping curves indicated reduction in sinus size, we could use change in DRM (i.e. ΔDRM) as a time-dependent measure of change in sinus size. The values of ΔDRM were comparable to the rate of size changes calculated from maxillary and sphenoid sinus volume measurement, with a mean difference approximately equal to zero (Fig. 2a and b). Having determined that the ΔDRM corresponded well with the change in volume measures of sinus size, we proceeded to control for other properties. The inter- and intraobserver variation of DRM was acceptable with ICC = 0.91 for both tests (Additional file 5: Figure S4). There was no change in DRM from baseline CT to last CT in the 15 control patients (Additional file 6: Figure S5). The change in sinus size measured by the ΔDRM combined with the GOSS from the last CT allowed us to divide the GPA patients into three groups as explained in Fig. 3: (i) Patients with flat curves (ΔDRM ≈0) and no osteitis, (ii) patients with flat curves and stable osteitis, and (iii) patients with decreasing curves (ΔDRM < median) indicative of progressive osteitis. The distribution of ΔDRM in the two groups with no or stable osteitis was similar to the control group and differed clearly from those with progressive osteitis (Fig. 4a). The three GPA groups are shown in Table 3. The baseline paranasal sinus symptoms were more common in the progressive group, where 49% of the patients had undergone paranasal sinus surgery. Longitudinal assessment of GOSS revealed that it had a greater tendency to level out than the DRM (compare Additional files 4: Figure S3 and 3: Figure S2). We found that DRM captured osteitis progression even in patients who had pre-existing or emerging sinus wall thickness >5 mm, and therefore maximum score of a sinus in GOSS, shown in Fig. 5 in two patients. One patient with stable osteitis established by the DRM method had a clear increase in GOSS. This patient developed a mucocele in the osteitis afflicted maxillary sinus and therefore had no reduction in the size of this sinus at the last CT despite progressive osteitis captured by the GOSS (Fig. 6). Additional file 7: Figure S6 shows that this particular patient in addition had an increase in GOSS mostly caused by progressive osteitis in the ethmoid and frontal sinuses (excluded from the DRM). This finding was unique. There were no other patients with stable osteitis by DRM and increasing GOSS due to progressive frontal or ethmoid osteitis (Additional file 7: Figure S6). This strongly suggests that the maxillary and sphenoid sinuses were the predominant contributors to GOSS in our GPA cohort. Even though paranasal sinus affliction is recognized as a major clinical challenge in GPA, there has been no systematic use of radiological tools for assessing sinus abnormalities except for the LM-score. Here, we show that longitudinal evaluation of GPA-related osteitis is feasible by GOSS combined with standardised diameter ratio measurements of maxillary and sphenoid sinuses. By this method we were able to capture and quantify osteitis all the way to complete obliteration. This is important as osteitis related to GPA can be very extensive (Fig. 5). An implicit goal of this study was to explore how the CT changes reflecting osteitis develop in GPA. Therefore, we chose to focus on a well classified and largely unselected register cohort including consecutive, consenting GPA patients that had conducted repeated CT scans from disease onset onwards, and had paranasal sinus wall thickness ranging from normal to extreme values. The cohort may be skewed towards more seriously afflicted GPA patients because it was from a tertiary referral centre and by including patients having at least three CT scans each. Still, we found that about one third of the cohort patients were free of osteitis during the entire study observation period. A potential pitfall with the GOSS is that it has a reader dependent definition of osteitis. Cho et al. tried to circumvent this problem by measuring the HU of the walls of the ethmoidal bulla and found that areas of high HU correlated with the areas with histopathological signs of osteitis. However, in a follow-up study, the author discovered that HU-measurements varied widely between different sinuses . Given these methodological uncertainties, we decided not to emphasize the bone quality, but instead focus on measures related to bone wall thickness. Since we aimed to perform long term observation of osteitis progression, we needed a method that allowed for retrospective analyses of serial CT scans originating from different hospitals and time periods. In this respect, it was important that the DRM method could be applied on thick slices and only one imaging plane, in contrast to semiautomatic volume segmentation methods which depend on volume series. Calculations of approximate sinus volumes from diameter measurements by an ellipsoid formula is previously shown not to be sufficiently accurate . Therefore, we decided to use the rate of change of the arithmetic mean instead. The advantage of this approach is that a missing value due to only one CT plane, will not result in a missing value for the summary (DRM). We included more than three diameters per sinus to get a more accurate measurement of change, and we introduced a ratio to control for different patient sizes and to try to reduce the influence of undefined measurement errors due to different CT machines and scanning techniques. By building the method on the change in sinus size (ΔDRM) rather than absolute measurements, we made the method more robust to different ways of measuring the diameters in the often widely varied shapes of the sinuses as long as the measure is consistent for each patient. There are, however, some caveats. First, DRM is probably not suitable for children, since physiological sinus growth may counteract time dependent changes in DRM. Second, occurrence of ballooning sinus walls due to mucocele may cause increasing DRM in patients with progressive osteitis, as shown in Fig. 6. Finally, reduction in sinus size due to silent sinus syndrome may cause decreasing DRM, but these patients will still be correctly classified in the no osteitis group if they have GOSS equal to zero. Even though DRM does not include the frontal and ethmoid sinuses, we found that this method captured early osteitis development in GPA to the same extent as the GOSS. The reason is probably that GPA-related osteitis most commonly afflicts the maxillary sinuses [16, 19, 20]. Wall thickness exceeding 5 mm, which is maximum GOSS for a sinus, seems not to be uncommon in GPA, and this explains why the GOSS is limited by a ceiling effect. In contrast, we show that the DRM can catch the wall thickness changes until full sinus obliteration. By combining DRM and GOSS, we were able to segregate the GPA cohort in three groups with different osteitis trajectories (no osteitis across time, stable osteitis and progressive osteitis). The distribution of baseline paranasal sinus symptoms and surgery varied between these groups, which indicate that further studies on risk factors for osteitis development are warranted. In the current study, we did not evaluate potential effects of surgery or other forms of GPA treatment due to lack of detailed clinical information. We have focused on CT as imaging tool for assessment of GPA-related sinonasal disease. Except for cases with orbital and/or CNS involvement and a study of Muhle et al. from 1997 , there is limited data on the potential of MRI in GPA. The results indicate that the rate of change in sinus size measured by a ratio of mean diameters (ΔDRM) is a useful and reliable method that complements GOSS and makes it possible to monitor the often extensive osteitis in GPA patients. In addition, we were able to define patient subsets which we think can be useful in further studies on risk factors for osteitis development in GPA. Jukka Corander and colleges at the Oslo Centre for Biostatistics and Epidemiology kindly provided statistical advice for this manuscript. This work was supported by the Norwegian ExtraFoundation for Health and Rehabilitation. SSH planned the study, collected and analysed the data, and wrote the manuscript, JMM performed the interobserver study together with SSH, KK and HH collected the clinical data, HBE and ØM were principal investigators and contributed in all phases of the study. All authors have critically revised the manuscript, and read and approved the final version of the article. The study was approved by The Regional Committee for Medical and Health Research Ethics in South East Norway. The study cohort consisted of 121 consecutive GPA patients from the Norwegian Systemic Connective Tissue Disease and Vasculitis Registry (NOSVAR), which is a consent-based research and quality registry run by the Department of Rheumatology at Oslo University Hospital (OUS). R Core Team. R: A Language and Environment for Statistical Computing [Computer Program]. Austria; 2018. Available from: https://www.R-project.org/.